Ali Allawi, "Iraq Got the Worst of All Worlds"
Ali Allawi, Iraq's first post-Saddam civilian minister of defense, was born in Baghdad in 1947. He was educated at the Massachusetts Institute of Technology, the London School of Economics, and Harvard University. On top of a long and successful career as a merchant banker, he has held visiting posts in a number of academic institutions, including the International Institute for Islamic Thought and Civilization in Kuala Lumpur, Malaysia, founded by the Islamic philosopher Syed Naquib al-Attas, and the Centre for Middle Eastern Studies at Oxford University. During the 1980s and the 1990s, Allawi was a prominent member of the London-based Iraqi opposition to Saddam Hussein's regime, and in 2002, was one of the drafters of a declaration of Iraqi Shiites, a statement that helped lay the groundwork for Saddam's ouster. Allawi returned to Iraq in September 2003 after forty-five years of exile and was made minister of trade in the Interim Iraq Governing Council, followed by a year's stint as minister of defense. 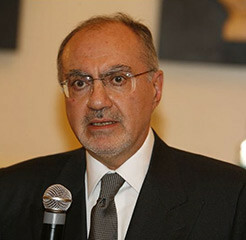 In January 2005, he was elected to Iraq's Transitional National Assembly, and three months later, was appointed minister of finance in the Transitional Government headed by Ibrahim al-Jaafari. He held this post until May 2006 when he returned to private life. Author of two prize winning books—The Occupation of Iraq: Winning the War, Losing the Peace and The Crisis of Islamic Civilization—Allawi is currently a senior visiting fellow at the Kennedy School of Government, Harvard University. Efraim Karsh interviewed him in London by telephone on July 26, 2010. Middle East Quarterly: With the benefit of hindsight, was the 2003 Iraq war justified? Ali Allawi: The answer, I am afraid, is equivocal. It depends on what term you use to justify the invasion. If you launch a war that is driven by mainly moral or ethical considerations with a specific purpose of removing a terrible dictatorship and replacing it with something else, then yes, you can make a case for that. But the war was never claimed to be a just war. It was waged in order to uncover weapons of mass destruction [WMD], so it's like a post factum justification. On balance, the answer is yes—we removed the dictatorship; no—because the mismanagement and subsequent disaster that befell the country could have been and should have been avoided and, therefore, perhaps overshadowed the removal of the dictatorship. MEQ: Apropos weapons of mass destruction. As Iraq's first minister of defense after the invasion, could you illuminate us as to what happened to them? Allawi: It seems to be clear now that there was no serious Iraqi nuclear program in the wake of the U.N. inspections and that whatever had existed was either successfully dismantled or was just a bluff. The main issue is whether Iraq had the capability of developing weapons of mass destruction after the 1991 Kuwait war. It may have had that in 1989, and it probably came very close to it, maybe a few months or a few years at the most. But the removal of the key elements of the weapons program, together with the sheer difficulty of getting supplies and appropriate equipment, might have made the effort useless, and it was used primarily as a bargaining or threatening tool by Saddam. Whether or not this was known to the Bush administration, we will have to wait for some time before the smoking gun evidence emerges. MEQ: Did the Iraqi government find any evidence of the existence of WMD or their possible removal out of the country? Allawi: There is perhaps a general overestimation of Iraq's ability to organize such a complex operation without access to the resources that Saddam had in the 1980s. The amount of money that came into Iraq then, some of which was used to fund this program, was simply not available in the 1990s. … I personally never thought back in the 1990s that there was a serious program. I thought it was a red herring. MEQ: But then, how do you explain Saddam's decision to risk total war? Given his all consuming paranoia and utter conviction that the Americans, among others, were out to get him, why didn't he simply let the inspectors into Iraq and let the whole world see that he had nothing to hide? Allawi: There are a lot of inexplicable decisions on Saddam's part. I still cannot understand why he sent his air force to Iran during the 1991 Kuwait war, why he didn't withdraw from Kuwait when it became clear that the coalition was going to attack, or why he persisted in goading the Americans [in 2003] into an irreversible decision. These decisions could have been made by a paranoiac. But they could also have been made by a man who never understood the strategic or the geostrategic circumstances in which he operated, and there were not enough people around him who had the courage to explain to him otherwise. So, there was an element of paranoia but also an element of ignorance of how Western policymakers, especially in America, make decisions and stick to them. He saw things mainly in terms of the crude conclusions about human nature he derived from his upbringing and life experience. It's like a street fighter's version of how events play out on the international scale. He was basically a brute, a very intelligent brute. MEQ: Still, this brutish worldview kept him in power for longer than any other ruler in Iraq's modern history and made war the only viable option to remove him. Allawi: The war came as a direct consequence of 9/11. Had there been no 9/11, American foreign policy was unlikely to have shifted this way. Could sanctions have brought this regime down? The answer is no, clearly not. Could the Iraqi opposition have achieved anything against Saddam? The answer is also no. Could a war triggered by supporting insurgents in Kurdistan spread to the rest of the country? The answer is clearly no. So from the Iraqi opposition's point of view, it was really an extraordinary event that overthrew Saddam. Looking back, I think it was rather futile to try to do it after the 1980s. MEQ: So perhaps the war's "accidental" origin explains its catastrophic aftermath. Allawi: What struck me most was the incoherence of American policy. It just doesn't make sense to undertake action of this size and scope—in some ways, very outlandish in terms of post-World War II international relations—only to allow that massive effort to deteriorate, like water slipping through your hand. The Americans really had only two choices: either to take responsibility for the consequences of the invasion and, therefore, manage the country until they changed its political culture, or to say, "We came here for this specific purpose; we have done this job. There are no weapons of mass destruction. The ideal of changing Iraq's political culture has never been on the agenda. It's time for us to get out." MEQ: How do you assess what took place? Allawi: I know that Iraq is not Panama or Grenada, but it really got the worst of all worlds: the destruction of whatever dysfunctional state had existed, without anything replacing it that is coherently meaningful; with massive expenditure of resources in an unplanned and uncoordinated way that could have, in a more determined way, played a fundamental part in changing the country's political culture. It's not that the Americans didn't spend money; they spent more money on a per capita basis than they probably spent on the Marshall Plan. But it was just so misguided and so ill-directed and not pulled together in a coherent strategy, with people who were indifferent to the long-term evolution of the country's institutions. That just doesn't make sense. MEQ: When did you come to this realization? Allawi: These issues became clear to me in September-October 2003 when I first went back. I kept a diary, and I made some of these observations back then. I argued that it was all going to end up in tears since there was no real effort to transform the country's institutions and political culture. Rather there was an attempt to build on a political culture that had not been thoroughly reformed at the root and branch with a pseudo-democratic superstructure attached to it without having a real chance of developing into a genuine, democratic culture. This, in turn, was bound to end up in a hybrid situation—a hybrid, authoritarian-democratic system with warped democratic institutions or supposedly representative institutions. But the counterargument is that one was operating in a barren landscape. There were very few choices available to either the U.S., or the coalition, or the Iraqi exiles who came back into power, apart from the Kurds who had their long-standing, quasi-national organizations that rooted them in the country. Everything else had to be imported. MEQ: Let's take the counterargument a step further. In The Occupation of Iraq, you cite King Faisal I, founding monarch of Iraq, as saying (in 1932) that "there is no Iraqi people inside Iraq. There are only diverse groups with no national sentiments." Likewise, you have recently argued that Iraq "is not a nation, at least not in terms of the commonly understood definitions of a nation." Has nothing changed during this 90-year period? Allawi: There is obviously a sense of "Iraqiness." The Arabs do have a sense that they are together in a kind of a long-term marriage, so to speak, in the context of the boundaries of modern Iraq. But there is nothing reflecting this communality at the level of loyalty to shared institutions or laws or to an identity that all parties adhere to and consider important. All view this identity as a corollary of its association to their own exercise of power. Take the Islamist parties, for example: In 2005, they were pushing for a decentralized, federal region, but once they began to exercise undivided power, the emphasis changed to the old Iraqi centralized state. There really is no common vision on the part of the various groups that constitute Iraq as to where the country should go and what kind of identity and role it should have at the end. MEQ: What you are pointing to has been an issue for a long time. Allawi: Yes, this problem has existed since the creation of Iraq in 1921, and nothing seems to have changed in a significant way. Regimes come and go, and they emphasize this or that aspect of the country, but there is no continuity in building national institutions that are free of sectarian considerations and are fair to the general population. The Baathists have perhaps been the worst of the lot, and their legacy is possibly the most detrimental, not least since it is etched even on the minds of their bitterest opponents. Thus, those who came into power used the levers of the Baathist state to their advantage rather than to reform and dismantle them (though at the superficial level they were democratized). The only difference is that now people are using the central state's huge powers for their own purposes rather than for Baath purposes or Saddam's purposes. If you wanted to get a job in Saddam's days you had to be a Baathist; now you have to be close to the group that controls the relevant ministry. For the ordinary person on the street, nothing much has changed. MEQ: You have recently argued that "there is nothing sacrosanct or inevitable about the survival of the Second Iraq State [i.e., post-Saddam Iraq]" and that "Iraqis must understand that this time around, the house may very well fall down on their heads if they don't find a way of living together and enjoying being together." Could you elaborate? Allawi: This is the last fling of the Second Iraq State. If the political caste doesn't come up with something that takes into account the huge changes and opportunities that arose as a result of the destruction of the old dictatorial state, their hold on power will drastically diminish and dissolve, and the state may not last beyond the next cycle. Something else may come up. MEQ: Are you saying that Iraq may disintegrate into a number of smaller states? Allawi: I don't think so. It remains to be seen how Iraq will be configured—as a centralized state, as a binational state, a confederation, or as something in between. The jury is still out on that. Allawi: I would build the state along the lines of a decentralized, federal system where a great deal of responsibility is put on the provincial and local authorities, who are in many ways closer to the people than the distant ministry in Baghdad, rather than repeat the buildup of the central state whose forms were basically outlined in the 1920s. This is because Iraq as a centralized state cannot really function in the long run unless there is high degree of political maturity or a dictatorship. There is just no way around it. Allawi: What exists now is, again, the worst of all worlds. There are central ministries trying to enforce their dysfunctional authority on provincial powers that haven't built up any institutional depth, with a Kurdish region that for all intents and purposes is on its own. And if you superimpose on this state of affairs electoral cycles of four or five years, manipulated by rulers seeking to perpetuate their power, then the state will disintegrate were it not for the oil revenues. If you take oil out of the equation, Iraq is one of the poorest states in the world. But with oil coming in, there will be a lot of expansion. This kind of ramshackle system might continue, but it is like a car or a machine operating at a much lower level than it is designed for. MEQ: This rationale seems to run counter to the conventional, pan-Arab criticism of the West, whereby the great powers broke the unity of the "Arab Nation" by carving a string of artificial nation-states out of the defunct Ottoman Empire. By contrast, you seem to suggest that they over-unified the region rather than divided it. Allawi: The Middle East can only function through large, confederal arrangements. It's not only a question of whether a state is centralized or decentralized, but also how you are going to relate to your neighbors. One of the reasons that empires were such a dominant form of government in the Middle East is because of the variety of nations and peoples. And when the format of empire began to be seriously questioned in the early twentieth century, there was no alternative on the ground apart from the ethnically-based nation-state. For a person like King Faisal, in these early days, to come up with a formula that would decentralize power—given that the British thought that the only thing that would keep Iraq intact was military force, whether theirs or somebody else's—would have required an abiding historical sense or political foresight that didn't really exist at that point. MEQ: Did the Europeans do a better job elsewhere in the region? Allawi: No other Middle Eastern state was organized on a decentralized basis. The French tried it in Syria, but it was seen as a way of weakening any resistance to them. Decentralization became a code word for acquiescence in colonial rule and for weakening the state, which was seen as the only agent of change, development, and empowerment. It was outside the zeitgeist as it were. The world has changed since then, and to use the same arguments to reject the ideas of decentralization, or federalism, and so on, is very disingenuous. There is no reason why you should use the arguments of the 1920s nowadays. MEQ: But wasn't the situation in the Middle East far more acute? Europe at least had the nation-state as a substitute for the fallen empires, but Middle Easterners were wholly unfamiliar with the idea of national self-determination. Their local loyalties were superseded only by submission to the Ottoman sultan-caliph in his capacity as the head of the Muslim community. Hence, when the Ottoman Empire collapsed, the gap was simply too wide to bridge. Allawi: Because of the West's overwhelming force—political, military, technological, and so on—it became associated with everything that was good and new. But there are certain formulae that could have evolved or worked better than the nation-state paradigm given the context of the area. Allawi: Until very late in the day, there was no great desire among Arabs to leave the Ottoman Empire and to create ethnically-based states, so there was always the possibility that a kind of non-national principle could be applied to the evolution or modernization of this empire. This opportunity fell for a variety of reasons in the post-World War I order and was replaced by a forced march into the nation-state without the necessary ingredients for the existence of such an entity beyond common ethnicity. So when I speak about empires as being kind of a natural state of affairs in the area, it's basically that the national principle doesn't work, except in ethnically homogenous states (with very few exceptions like the United States). Even beyond the Middle East, in places where the national ideal has been far more firmly rooted, there are very few multiethnic countries that are functioning democracies. There is always a tension in such societies that frequently leads to breakup, which is what happened in Czechoslovakia and nearly happened in Canada. MEQ: Can pan-Arabism substitute for the nation-state in the Middle East? Allawi: Today you hear the argument that one of the effects of the war has been to isolate or quarantine Iraq from its Arab connections. The idea of being an Arab and being a part of a larger unity or grouping has been current since the 1920s at the expense of any local identity. But it is precisely the dead-end way in which pan-Arabism was formulated, that excluded any local considerations, local divisions, and local sensibilities, that led to its demise well before the Iraq war. Now, to accommodate this tension in a new political framework, outside an imperial structure or a confederal structure, you have to be centralized. So we go back full circle to the forms of government that successfully operated in the Islamic world, which were either empires or highly localized dynasties, which didn't operate like modern states but were based on local factors and considerations. The Ottoman world could have easily survived as a kind of Turkish-Arab or maybe some Balkan Muslim confederation, held together by allegiance to a broader identity with highly decentralized, local authorities. But then, this always takes place at the expense of the centralized state and the military aspect of it, and in those days there were enough military threats for the Ottomans not to take this option too seriously. MEQ: Does this mean the best solution to Iraq's domestic instability is a strong dynasty or a leader? Allawi: Either that or you must create a certain equilibrium at a much lower basis than the centralized state, so that issues of contention are not negotiated and resolved at the national level but become local questions. So, for example, the Shiites can have their own educational curriculum, and each province can define its own issues within a loose understanding of what Iraqi citizenship means. Attempting to build a central state now by cobbling together a coalition based on ethno-sectarian balances will only create a very strong political class that dominates the state but not a real national identity. MEQ: In other words, transforming Iraq into a mini Ottoman Empire. Allawi: Yes. Perhaps it is too small a unit to have that kind of thing, but if you take this model and expand it, it can work for the Arab world. MEQ: This is of course the opposite of the concept of pan-Arabism or qawmiya. Allawi: Yes, but then it is more modern because it is more appropriate. With it will come a great deal of stability and, therefore, economic development that will increase the resources generated for the common good, which will hopefully not be wasted on military power. You can do a lot of good with this kind of system. MEQ: A decentralized Arab world? Allawi: A decentralized Arab world welded together by very strong agreements and contracts with institutions of a super-national nature that manage aspects of common interest. You can start that at a national level, the Iraqi level, and move from there. It's not reinventing the wheel. The U.S. has the same relationship with its constituent states. So you can weave coordinated institutions on top of a decentralized political order that is held together by a communality of purpose. MEQ: Something like the European Union? Allawi: Maybe the EU after the decentralization that is taking place. The EU still has a long way to go before it gets the right balance. Its member states are undergoing dramatic changes, and it will become basically a mosaic of interests held together by a strong bond, by a set of common principles, and a strong constitutional structure, one that is properly negotiated and implemented, around which every element of the state can be reconfigured rather than a slapped together affair. MEQ: But how does this scheme conform to the Islamic order of things? Islam is about unification, not decentralization, isn't it? Allawi: It is unification at one level. I am speaking now obviously as a person who believes in the tenets of Islam. To me Islam operates at the level of the other world, the spiritual level, the level of the unseen. But there are certain ethical virtues and principles that should be reflected at the level of a political order. Islam expressed ideally is not a religion of empire, though in practice it often took this route. In an ideal form, Islam is an urban civilization, a civilization based on cities, on localities. It was most successful when it was a confederation of cities and dynasties not necessarily held together by imperial force. These things wax and wane, have a certain dynamic. To me, an ethical basis of a government that responds to the Qur'anic principles of justice is where you have as low a barrier as possible between rulers and ruled—the greater the proximity the better, the greater the interaction and engagement the better. Ideally this can presumably take place only in a medieval community of 10,000 people, but in the absence of this, we are talking about decentralized forms. The ideal forms of Islamic government are confederations of cities and regions held together by a certain common allegiance rather than an imperial power operating out of highly centralized, bureaucratic structures. The way that Muslim forms of government evolved over time, and the way that they subjected the ideal to the imperial standard is, in many ways, antithetical to the ideal of Islam and also antithetical to the post-modern options that we have. So, not so much a Dubai-type system but probably not too dissimilar from it. MEQ: What changes would be necessary in Iraq to bring such a system into existence? Allawi: If you look at it in terms of Iraq, I would spend a great deal of effort rebuilding the urban cultures of the country. Take Basra, which has the potential to live out its geographical destiny and to become a magnet to the [Persian] Gulf. This kind of networking of urban states and regions—maybe even in a post-nation-state formula—is something that would be not only desirable but would also push us to living the sort of life that reflects the ethical requirements of religion rather than thinking of Islam only in the context of political power, army, resources, etc. If you had, say, twenty units of this kind, probably the sum total of their contribution, both quantitatively and qualitatively, will be greater than one state, or super-state, based on these units. So, it requires basically a re-imagination of the future that is not confined by the dimensions of the past. And you can start in Iraq because that's where the challenges are very big. Perhaps 90 percent of the problems will go. A new dynamism will emerge. Assuming, of course, that the fear of chaos, always under the surface, does not break out, which is something that has bedeviled history, certainly Islamic history: the tendency toward chaos and disorder if there is no central power on top. But again, one has to rethink these things in modern times. One reason why small units did not become a viable alternative is probably because of this fear, because whenever one unit became more powerful and more forceful and had better military talent at its disposal, it turned itself into an empire. This kind of paradigm can't hold anymore. There is a natural sort of limit to the ambition of small units when they get out of their bounds. One can't just go out and invade the world anymore. Allawi: Persons claiming to be guided by the principles of Islam cannot but go except in this direction. You have to overcome the defense mechanisms that push you into taking this retrograde course. You have to transcend them. Obviously, it's not possible to do this overnight, but you can do that in the context of well articulated policies that take into account all the risks of building these kind of structures, so that at the end, you'll have a constellation of regions and states, and it will work well, including solving the larger problems in the area. MEQ: I am afraid you'll need a different kind of leadership for this vision. MEQ: Is it one of the reasons you are not there? Allawi: I am actually going there next week. I am now on the margins, but I try to do whatever I can to help develop Iraqi civil society, however imperfect the term is. "Delaration of the Shia of Iraq," London, July 2002. New Haven: Yale University Press, 2007. New Haven: Yale University Press, 2009. Ali A. Allawi, "The Iraqi Crisis and the Future of the Middle East Order," Nov. 4, 2009. Related Topics: Iraq | Fall 2010 MEQ receive the latest by email: subscribe to the free mef mailing list This text may be reposted or forwarded so long as it is presented as an integral whole with complete and accurate information provided about its author, date, place of publication, and original URL.